Jump Start Your online marketing In 48 Hours Or Less.. â€œInstantly Eliminate The Difficult Learning Curve With A Fool Proof Guide To making money online - Exclusively For Newbies!" Here are just a few of the many things you will learn: EXACTLY How to create your online business cash machine. This is where I will reveal short cut methods of setting up a well structured, highly profitable online business in any market. How to choose a million dollar market. This is where 99% of new marketers fail, simply because they choose the WRONG niche. I will show you exactly how to guarantee you always choose winners. How to find killer keywords to use in your marketing campaigns in 12 minutes or less! You don't have to spend hours like the 'other guys do Discover the one "secret source" of exploring hidden niche markets that will crank out insane profits! This is the ONE source I use to find the hottest markets that everyone else is overlooking How to make a fortune in affiliate marketing, even if you have absolutely no experience! These quick start strategies will show you exactly how you can generate your first paycheck in days! Exploit FREE traffic generation tactics that will instantly flood your website with a surge of targeted prospects.. These are the techniques used by the Internet's most successful marketers.. And Much, Much More! Gone are the days where you spun your wheels in a pot hole that you couldn't get out of.. no longer will you ever have to sit where you are right now, confused and frustrated because you're sick of hearing about how successful everyone else is, while you can barely break even. Finally, everything is about to change. 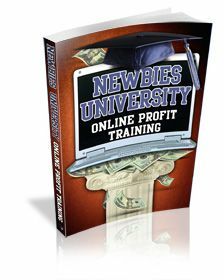 Grab your copy of the Newbies University guide to making money online, and within a few short hours you will be equipped and ready to start your online business, headed in the right direction.. towards profit! EXACTLY How to create your online business cash machine. flood your website with a surge of targeted prospects..
everyone else is, while you can barely break even. the right direction.. towards profit!